With an impending invasion of mega monsters, giant gorillas, fire-breathing lizards and the like, I thought it worth noting that for over four-decades the UK has had a tried and tested method for dealing with these behemoths when they go on a rampage. All you need is a pack of chewy sweets to stop them eating Barrow-in-Furness Bus Station and they don’t even have to be the kind that make your mouth water. Chewits were originally made in the Mersey town of Southport in the early Sixties, little cubes of fruity fun that came in a variety of flavours. They tapped into something special in 1976 when advertising firm French Gold Abbott devised a campaign that relied on a pastiche of Fifties monster movies. The “Monster Muncher” as he was initially known could only be sated by a bundle of chewy sweets. The old Blitz spirit was also invoked in a later ad that spoofed wartime public safety news reels. 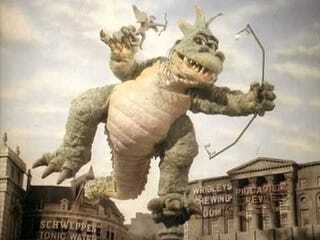 The original ads used a claymation style animation following in the footsteps of Ray Harryhausen. Chewie as he is now. More recent variations have gone for a cartoon form with Chewie going for all-out dragon cutes. Much as I like the originals that song from the ‘Naughties campaign does stick in the mind. The Chewitsaurus knows how to move!